Katherine and Greg go to the Carlisle Diner. The Carlisle Diner is an American-style diner, and it’s open 24 hours a day. It’s very close to Dickinson College. It’s popular among Dickinson students and Carlisle residents. Thai Cuisine is a local restaurant in the Carlisle area which provides a range of foods from the Thailand region. The food recipes were carefully constructed by the business’ owner Joy who is from Thailand herself. The restaurant focuses on providing quality dishes made from only fresh and authentic Thai ingredients. Thai Cuisine is extremely popular among Dickinson students and is trusted for its quality service. Please visit Thai Cuisine at 141 W High Street in Carlisle the next time you visit the Dickinson College campus if you are looking for great food and exceptional service. Nick, Mia, Beryl and Dineydi have visited Helena’s Chocolate Cafe & Creperie, which is a popular cafe shop in downtown Carlisle. The cafe shop is about a ten-minute walk from the Dickinson campus. The video below introduces the history, direction and menu of the cafe. 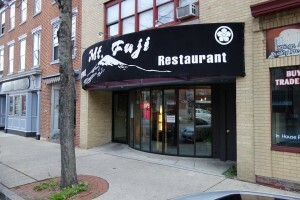 The number one sushi restaurant in Carlisle is definitely Mount Fuji, on Hanover Street. From Dickinson, it takes about ten minutes to walk there; by car it only takes about 5. It has delicious sushi and is in a very convenient location; see for yourself!